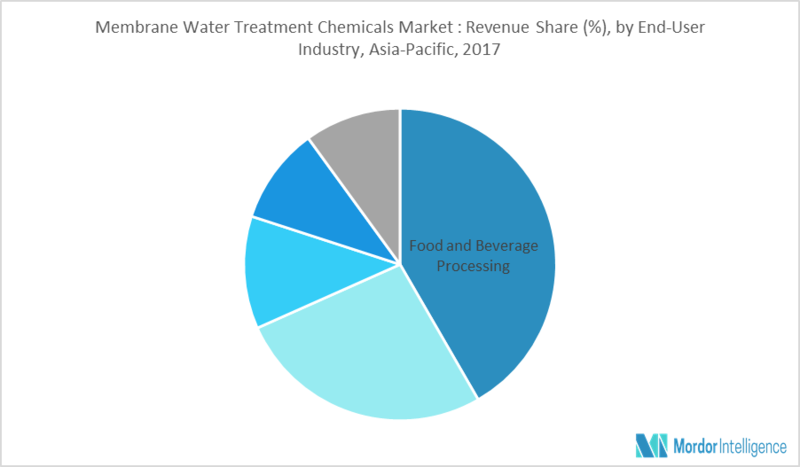 The Asia-Pacific membrane water treatment chemicals market is expected to grow at a significant rate during the forecast period of 2018 - 2023. The major factor promoting the demand for membrane water treatment chemicals market is the increasing demand for fresh water in countries with scant resources that are trying to harness fresh water from saline water. The municipal and manufacturing sector has also increased the demand for water treatment chemicals. In boiler water towers, more than 80%-85% of the water turns into steam. However, the water that is allowed to evaporate is not completely clean and contains various salts, dissolved solids, and microbes, which in turn, makes the water toxic. The water disposed to control dissolved solids and other particles is called ‘blowdown’. Most industries leave this toxic blowdown into the environment, citing expensive treatment processes as the reason to do so. Various countries are implementing stringent environmental regulations to maintain the ecological balance. Water treatment chemicals that greatly minimize blowdown are gaining popularity due to environmental concerns. The current regulations demand the adoption of zero liquid blowdown. Water treatment chemicals need to be injected into the boiling liquid streams frequently to achieve zero liquid blowdown. This greatly raises the usage of water treatment chemicals in boilers to maintain desirable conditions and efficiency. It is essential for the food & beverage industry to maintain hygiene standards set by the concerned federal agencies at all times so that the products are suitable for consumption. To ensure prevention of problems due to corrosion, fouling, and scaling chemical treatments are regularly used on boiler water. Volatile corrosion inhibitors, antiscalants, and cleaning chemicals are added to the treatment system, so that along with the water, the chemical is carried over into the pipes for protection against corrosion, scaling, fouling, etc. The quality of water being used in the plant is critical, and hence chemical treatments are performed to ensure adherence to set health standards. This, in turn, is driving the demand for water treatment chemicals. China is projected to grow significantly during the forecast period due to the adoption of strict environmental regulations. Owing to water scarcity and rising environmental concerns, China adopted zero liquid discharge (ZLD) technology to reduce the increased toxic gas and particulate emissions. Following China, India and other South Asian countries, have successfully implemented the ZLD in the industrial plants, power industries, and refineries, which in turn, is driving the market. September 2017: Avista Technologies to re-evaluate plant systems to optimize membrane performance. March 2017: Suez to buy GE water treatment unit. Major Players: Kurita Water Industries Ltd, Ecolab, Inc., Kemira Oyj, Suez, and Veolia Water Solutions and Technologies, among others. To understand which country is expected to witness the fastest growth during the forecast period.